Inspire Happy Hour is Back! It has been a while since I have been able to showcase a prohibition drink and here is the one you have been waiting for. I recently made the Sidecar for my friends and it was a hit. Originally this drink was said to be invented after WWI in London or Paris. The Ritz Hotel in Paris claims origin of the drink. If desired, rim a chilled cocktail glass with sugar. 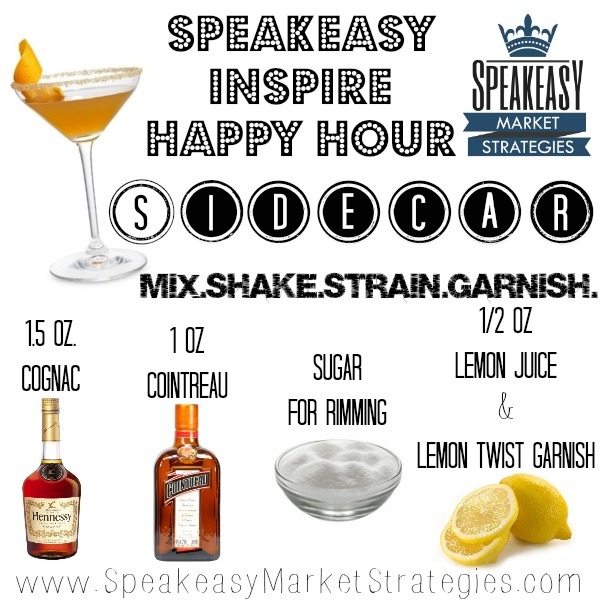 Give the Sidecar a try and let us know what you think in the comment section below. Remember to take time to enjoy happy hour, but drink responsibly*. I would love to make the Sidecar with you and enjoy Happy Hour with you, but alas I cannot. But what I can do is help you brainstorm and grow your business through sound marketing strategy. If you would like one-on-one time with me, simply click on this link and set up a time that works for you or you can click the “Contact Us Now” button. Let me help to get the word out about your company today! Let’s get started, why wait? *Speakeasy Market Strategies does not condone underage or irresponsible drinking. Make wise choices ladies and gents! 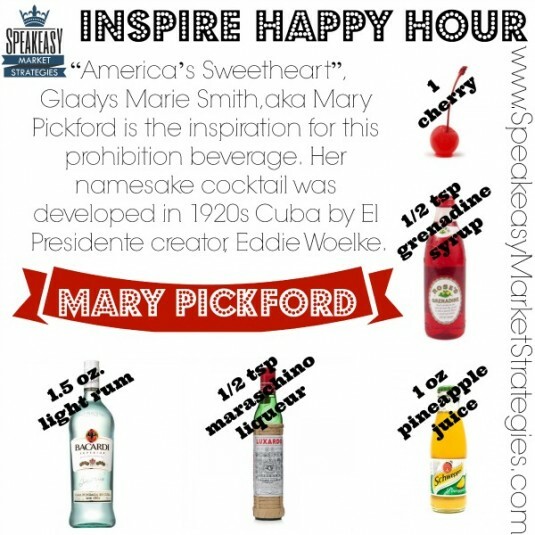 You've worked hard all week, now it is time to celebrate your accomplishments with this week’s Inspire Happy Hour Cocktail, the Mary Pickford. It was a total of 95 degrees today, which in my book means time to mix that summer cocktail once the work is done. This week's Prohibition cocktail recipe is called the Mary Pickford, aka "America's Sweetheart." No not of the modern day, but back in the 1920's she was a silent movie icon. She even went on to be one of the original founders of The Academy of Motion Pictures Arts and Sciences. The cocktail itself was developed in Cuba by El Presidente creator, Eddie Woelke. Like many in the bartending industry during Prohibition, he fled to Cuba to mix his drinks in peace. Combine ingredients (minus cherry garnish) in a shaker half-filled with ice cubes. Give the Mary Pickford a try and let us know what you think in the comment section below. Remember to take time to enjoy happy hour, but drink responsibly*. I would love to make the Mary Pickford with you and enjoy Happy Hour with you, but alas I cannot. But what I can do is help you brainstorm and grow your business through sound marketing strategy. If you would like one-on-one time with me, simply click on this link and set up a time that works for you or you can click the “Contact Us Now” button. Let me help to get the word out about your company today! Let’s get started, why wait? Well I don't know about where you live, but here in Tulsa, Oklahoma summer is officially here. What better way to kick off the hot weather but with a refreshing vintage cocktail. 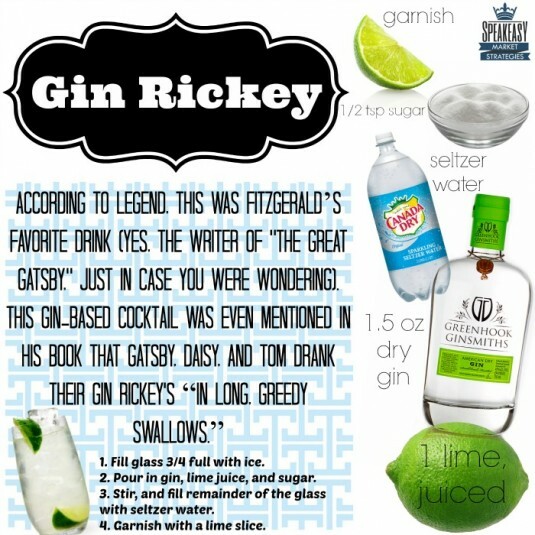 Although the Gin Rickey was created in the late 1890's, it became popular in the 1920's due to its main ingredient, gin. Fill a highball glass 3/4 full with cracked ice. Pour in gin, lime juice, and sugar into glass. Fill the rest of the glass with seltzer water. Let us know how this refreshing cocktail works out for you. Remember to take time to enjoy happy hour, but drink responsibly*. Leave a comment below and let us know what you think. Even though I would love to sit down and have this cocktail with you, that is just not reality. But what I can do is help you brainstorm and grow your business through sound marketing strategy. If you would like one-on-one time with me, simply click on this link and set up a time that works for you or you can click the “Contact Us Now” button. Let me help to get the word out about your company today! Let’s get started, what are you waiting for? You have worked hard all week....now it is time for Happy Hour! This cocktail was first created back in the 1800s, but because of its main ingredients of gin and vermouth, it resurfaced during Prohibition. Known as the cousin of the Martini, it does give a kick. 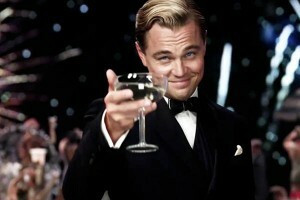 Gatsby would recommend it, so go ahead and give it a try, especially of you are a fan of martinis. Mix ingredients together in a shaker (except cherry garnish). Shake vigorously for 35 seconds. Strain and pour into martini glass. Add cherry garnish and serve. Personally I am excited to give this recipe a try. Let us know what you think once you try it. Now it you really love it, feel free to share, tweet, and spread this post using the icons at the bottom of this post. Even though I would love to sit down and have this cocktail with you, that is just not reality. But what I can do is help you brainstorm and grow your business through sound marketing strategy and digital marketing. If you would like one-on-one time with me, simply click on this link and set up a time that works for you or you can click the “Contact Us Now” button. Let me help to get the word out about your company today! Let's get started, what are you waiting for? You have worked hard all week, now it is time to let loose a bit with a Bee's Knees! 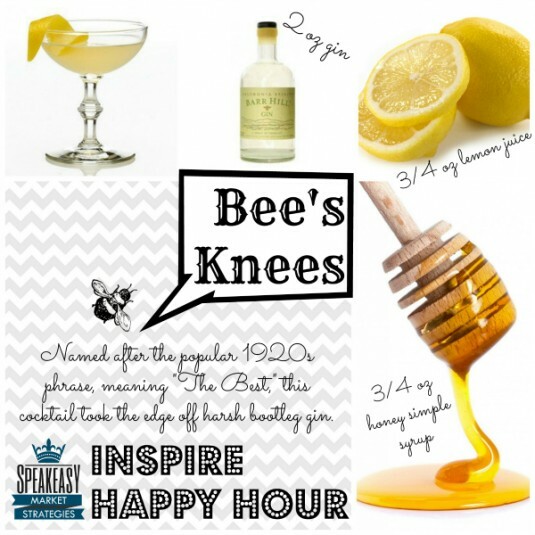 This week's Speakeasy Inspire Happy Hour drink is named after the popular 1920s phrase "Bee's Knees." Meaning, "the best," this cocktail at the time helped to mask the harsh flavor and smell of bootleg bathtub gin. Gin has significantly improved since the 20s and this cocktail is still a celebrated classic enjoyed today. Shake ingredients together in a shaker with cracked ice. Let us know what you think of this sweet-tart concoction in the comments below. Now if you REALLY like it, feel free to share, tweet, and pin this post using the buttons below. I may not be able to take you out for a Bee's Knees, but I am here to help you make this amazing cocktail and to help your business. Click the “Contact Us Now” button if you would like my help to get the word out about your company. If you need help brainstorming ideas for your next promotion or project, I can help you with that. Even if you are not in Tulsa, I click here for my brainstorming services available for you to purchase to get one-on-one help from me. Get out of the office and celebrate your hard work. Today Speakeasy Market Strategies is featuring the French 75 cocktail. This drink was named after an innovative piece of French artillery back in WWI by a French American pilot. He was not impressed with the potency of champagne, therefore he added the following ingredients to create the French 75. He named it this because he felt like after drinking this concoction that if felt like being on the receiving end of a French 75mm howitzer artillery piece. This cocktail is not for the light-hearted and gives a kick! Shake gin, simple syrup, and lemon juice together in a shaker with cracked ice. Top off mixture in glass with champagne. Let us know what you think of the French 75. Feel free to tweet, share, and pin this post if you love the drink! I may not be able to take you out for a French 75, but I am here to help you make this amazing cocktail and to help your business. Click the “Contact Us Now” button if you would like my help to get the word out about your company. If you need help brainstorming ideas for your next promotion or project, I can help you with that. Even if you are not in Tulsa, I click here for my brainstorming services available for you to purchase to get one-on-one help from me. It’s the end of another week and now it is time to celebrate all of your hard work. This week’s prohibition cocktail is the Southside. The origin of this drink is a little muddy, but most say it was the drink of choice for Al Capone & his gang. Some say it came from the South Side of Chicago and created to eliminate the harsh taste of bootleg gin. Yet others profess it is from NYC's "21" Club, where it is a signature cocktail today. Shake all ingredients vigorously in a cocktail shaker. Let us know what you think of the Southside. Leave a comment below and tweet, share, pin it if you LOVE it. I may not be able to take you out for that drink, but I am here to helping you make this amazing cocktail. Besides helping you make this cocktail, I can also help you if you are a struggling business owner and you want to be able to get back to what you do best. Click the “Contact Us Now” button to get started. If you need help brainstorming ideas for your next promotion or project, I can help you with that. Even if you are not in Tulsa, I click here for my brainstorming services available for you to purchase to get one-on-one help from me. It's the end of another week and now it is time to celebrate all of your hard work. This week's prohibition cocktail is the Clover Club. Known as the thinking-person's Cosmo, this drink was developed & served at The Clover Club, one of the finest speakeasies. This wasn’t your typical juice joint, as you’d find celebrities and socialites congregating. Shake all ingredients well in a cocktail shaker with cracked ice to help the egg white foam up. Some may think it is a girly drink, but it certainly is not. During Prohibition people used to make their own gin in their bathtubs, making today's version much tastier and appealing (for those over 21 of course). This drink recipe is originally from the The Savoy Cocktail Book, 1976 edition. Leave a comment below to let us know how you like the recipe. Happy Friday fans! Each Friday I will be featuring a vintage cocktail to get your weekend started off right. After all, this company is named after one of the most popular drinking establishments to hit the US. You have worked so hard during the week and the point of this company is to give your solutions that make your life easier and allow you to enjoy what you love, whether that is happy hour, your family, or both! Now for a mini history lesson for you. During Prohibition, the sale of alcohol was prohibited, which led to the creation of the speakeasy. These underground bars sold bootleg and illegal liquor to the people of the roaring 20s. Today's featured drink, Ward 8 was popular for it masked the harshness of the bootleg rye whiskey. Try it for yourself (those that are 21 and over of course). Combine all ingredients (including ice) inside a shaker. Strain into a cocktail glass (or perhaps a Mason jar like in the 20s). Hope you all enjoy the recipe as much as I did. Disconnect from the daily grind this weekend, we will be here to help make your marketing less of a chore. Let us know what you think of the drink in the comments below. If you have any drinkpreferences let us know and we may feature it next week!.